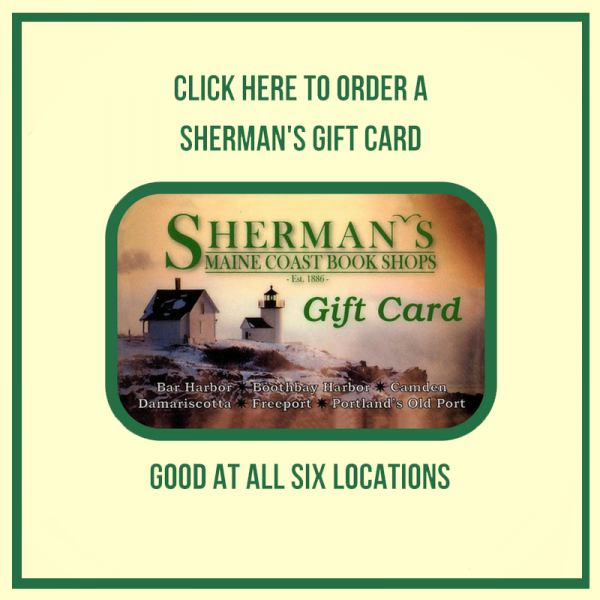 Sherman's Maine Coast Book Shops are located in six great communities along the Coast of Maine...Bar Harbor, Camden, Damariscotta, Boothbay Harbor, Freeport, and Portland. Our Damariscotta store also features the "& Café" a great place to meet up with friends and discuss your favorite book. All six stores are open year-round, seven days a week. Check the store listing for store hours and telephone numbers and email addresses. We excel at customer service and our staff in each store will be more than happy to help you find the right book. While you're in, ask about joining our Frequent Buyers Club. The Club is our way of saying "thank you" to our loyal customers. No punch card to carry, just tell us you are a member each time you make a purchase and we'll give you a $10 discount for every $100 you spend. Bill Sherman bought a printing press and established "W.H. 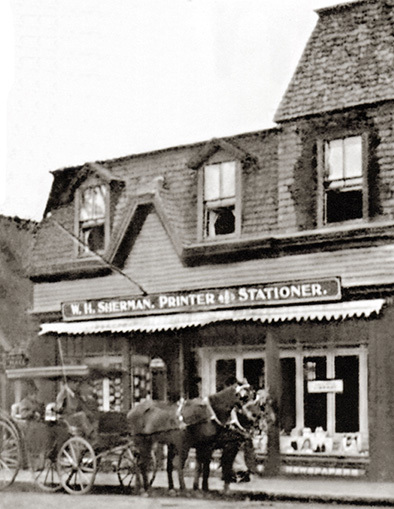 Sherman, Printer & Stationer" in Bar Harbor in 1886. 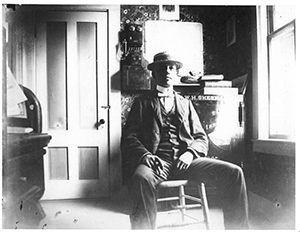 Throughout the late 1800's and early 1900's, Bill Sherman kept his printing press busy printing Bar Harbor's local newspaper, his own books, and smaller jobs for local residents and Bar Harbor's summer visitors. In addition, he sold books and office supplies from his Bar Harbor storefront. 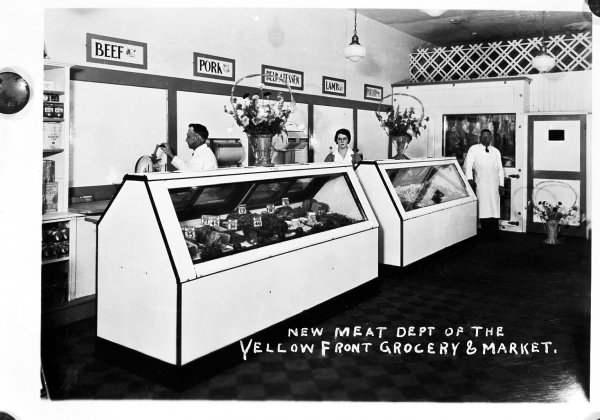 In the early 1900's, Bill Sherman's four daughters took over the business. By this time the printing press part of the business was minor. The emphasis had become the books and stationery. In 1962, the Sherman sisters sold the store to Michael & Patricia Curtis, who had recently moved back to their hometown Bar Harbor. On their first day in business, a snowy day in January, the store took in only $12, not much to feed a family of 7! But Mike Curtis came home that night with a big smile on his face. When asked why he was so happy after a day of such poor sales, he explained that people had come in the store all day long asking for things he didn't have; he knew that all he had to do was fill the store with the right merchandise and the store would prosper. Over the next 3 decades, Mike & Pat Curtis grew the small store into a Bar Harbor landmark by doing just that. Whenever a customer would ask for an item that wasn't available at Sherman's or other Bar Harbor stores, the item would be added to the store's growing inventory. This approach resulted in a unique store which stocks a full selection of books displayed alongside extensive selections of stationery, journals, office and art supplies, greeting cards, toys, housewares, gifts, Maine mementos, and jewelry. In 1989, a new generation entered the business when Audrey & Jeff Curtis opened Sherman's of Boothbay Harbor. Building on Mike & Pat's experience & success in Bar Harbor, the Boothbay Harbor store has grown over the years to 2 large floors which offer shoppers an eclectic shopping experience ranging from the full bookstore on the second floor to the upbeat toys, gifts, souvenirs, housewares and stationery on the first floor. In 1998, Sherman's opened in Freeport. Located in a new building on the corner of Main and School Streets, Sherman's of Freeport has successfully transported the fun and unique shopping experience of the Bar Harbor and Boothbay Harbor stores to Freeport. In 2004, Sherman's of Camden opened in downtown Camden. The Camden location was completely renovated to provide a cozy, welcoming place to browse our books and stationery. Unlike the other, bigger stores, our Camden store emphasizes the books, stationery, and toys with less room devoted to gifts, souvenirs, and housewares. In 2013, a third Curtis generation entered the business when Audrey & Jeff's daughter, Tori, joined the company. Tori was instrumental in the opening of Sherman's of Portland at 49 Exchange Street in Portland's Old Port in 2014. Tori's vision helped create a unique blending of books and thoughtful gifts into our popular Old Port store. In 2016, In our 130th year, Sherman's entered into an exciting new chapter when it purchased the Maine Coast Book Shop in Damariscotta. in recognition of the esteemed 52 year history of the Maine Coast Book Shop, Sherman's changed its name to Sherman's Maine Coast Book Shops. 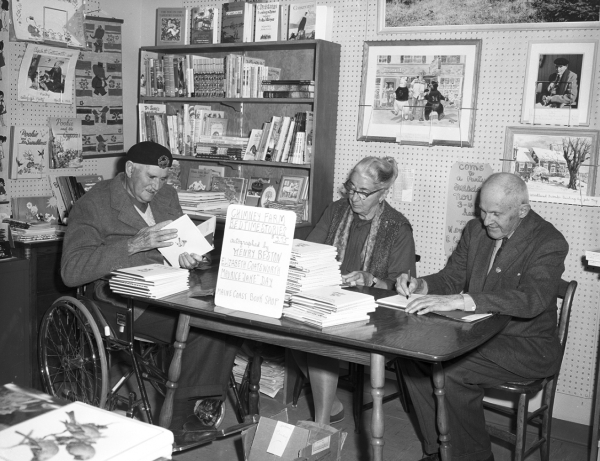 Henry Beston, Elizabeth Coatsworth, and Jake Day signing books. The Maine Coast Book Shop was originally started in 1964 by the two Mosman sisters in the Day Block on Damariscotta’s Main Street. Their modest plan was to offer a selection of books, stationery, and Bridge cards and tallies. As a further service, they were also a rental library for new books. 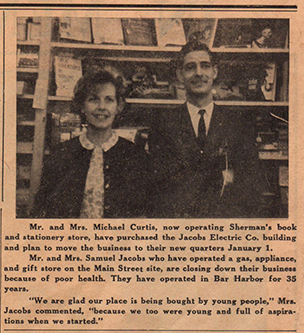 In 1972, Ewing Walker bought the Book Shop, and a year or so later he hired Susan Porter as manager. 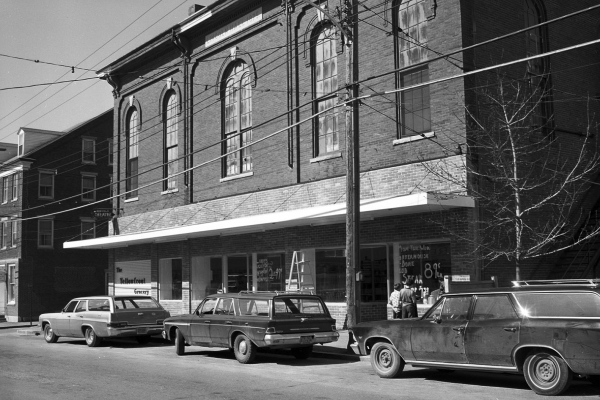 A few years later, in 1978, the Book Shop then moved across the street to the space now occupied by Sheepscot River Pottery. It was 1986 when Susan, along with Penny Walker and renowned children's book author and illustrator Barbara Cooney, took over as owners. As the business grew, it became apparent a decision had to be made: stay put and stay small, or move to a bigger space and let the business expand. They chose to grow, and so moved once again in the summer of 1993: this time across the street to the old Yellow Front Grocery Store space in Lincoln Hall. Susan Porter eventually assumed full ownership of the business and in 2000 decided to not only expand the store space again, but also to purchase the entire ground floor of Lincoln Hall (which is a condominium, shared with the Lincoln Theater above), to make major renovations, and to add the café that Main Street has always cried out for. She put her husband, Barnaby Porter, to work on this plan, drove him hard, and by the spring of 2002 the all new, bigger and better Maine Coast Book Shop & Café opened its doors to become what it is today. After a long career as a staple of the community, Susan decided in 2015 to look towards retirement. 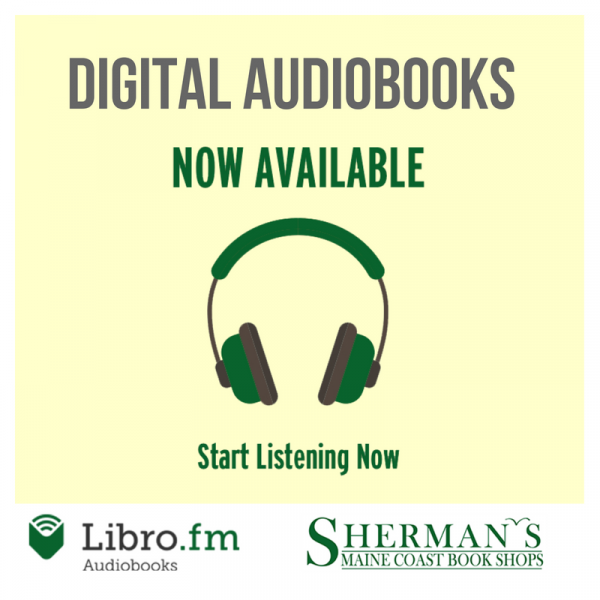 She searched high and low for the right buyers to continue the Book Shop, and Sherman's is very proud that she felt comfortable entrusting her legacy to us. Throughout the years, both Sherman's and the Maine Coast Book Shop have received "Best in Maine" and other prestigious awards. Sherman's has grown over the years by listening and catering to our customers. Our customers have rewarded us with incredible loyalty and support. Many of our year-round customers have been overheard to wonder aloud how they would get by if Sherman's were not open 362 days each year (sorry, you won't find us anywhere to be seen on Thanksgiving, Christmas, or New Year's Day). Repeat summer visitors to our resort locations often report that Sherman's is the first stop many members of the family want to make upon arriving back the next year.